I ordered a fried chicken and waffle plate last weekend at a local cafe. 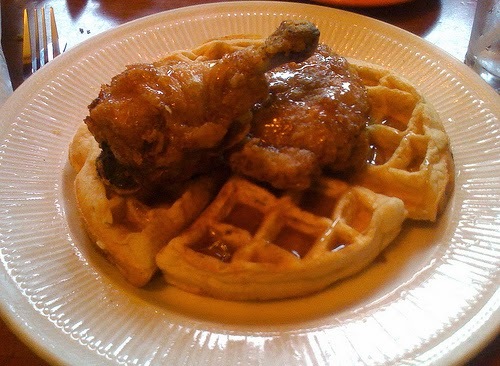 The trendy entree was on the eatery's Fall Special Menu, and it was luscious... a smallish round waffle with warmed maple syrup, and a freshly fried chicken leg and thigh. Most of my meals these days are what friends would call healthy: Greek yogurt, whole-grain granola and seasonal fruit for breakfast; salads for lunch; and dinners filled with veggies, whole-wheat pastas, homemade soups. Not much bread. 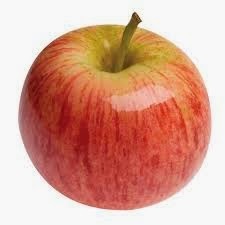 Often an apple for dessert. Coffee and water to drink. No soft drinks. Vegetarian days are not unusual. I feel better when I eat this way... and frankly, feel lousy when I've eaten greasy, dense, sugary, or carb-heavy foods. But oh boy, once in a while, an indulgent dish such as The Filling Station's fried chicken and waffle plate satisfies to a full, pleased smile. I tell you this to clarify the mission of my FakeFoodWatch.com blog: I don't directly eat for health. I eat to feel good, and to savor the experience of delicious food. And I don't believe that scolding or nagging others ever leads to healthier eating habits. Ever. That's simply not human nature! FakeFoodWatch.com is not a health site. Nor is it an animal rights advocacy site. FakeFoodWatch.com is a food policy and investigation site. I fervently believe that all people in free societies have a right to full facts about the foods they choose to ingest... origins, added ingredients, cleanliness, age, and processing, handling and storage protocols and realities. how food you eat affects how you feel, and ultimately how it affects your and your loved ones' health and longevity. You see, I believe that we should have enough information to make well-informed choices about food. The federal government and mega-corporations should NOT be making those choices for us, and should NOT be allowed to cleverly obscure or hide accurate, understandable, relevant info from consumers. Sadly, the FDA in the 21st century acts far more interested in protecting corporate profits (and political donors) than the health and welfare of Americans. And industrial food mega-corporations are interested in only one goal: profits. Period. Your health matters naught to most fake-food makers and purveyors. I believe that every American has the right to the real, old-fashioned food enjoyed by our grandparents and ancestors: food unadulterated by chemicals, additives, cheap fillers, artificial flavors, colors, and taste enhancers, or genetic engineering. And every American has the equal right to indulge in fast, fried, and highly processed foods, and anything and everything legal and non-poisonous. Indeed, everyone has the delightful right to feast on a fried chicken and waffle plate, at their whim. So please, don't mistake FakeFoodWatch.com for a health site. Think of this pet project of mine as a site that advocates for transparency in all things related to food. And respects your right to make your own choice.